A wolf pack: the first three in the column are the old or sick, they give the pace to the entire pack. 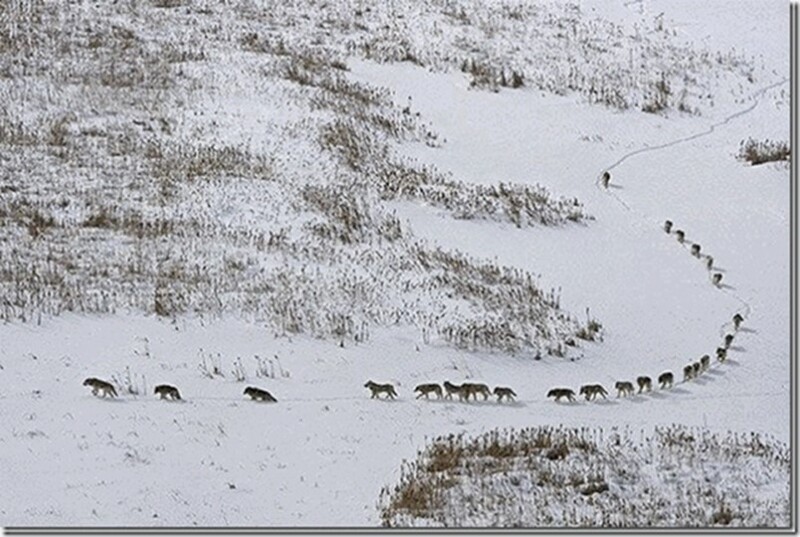 If it was the other way round, they would be left behind, losing contact with the pack. In case of an ambush they would be sacrificed. This is their way of caring for their kind.Then come five strong ones, the front line. In the centre are the rest of the pack members, with the five strongest following in the rear. Last is the leader alone. The alpha. He controls everything from the rear. In that position he can see everything, decide the direction. He sees all of the pack. The pack moves according to the elders pace and help each other, watch each other. at the impartial hands of nature. into wakes of devastated dreams. for those who can’t swim. the strength in the pack. Copyright © Henri Ferguson 2013 all rights reserved. June 19-21, 2013 here in Canmore, AB. we received more than 200mm of rain in less than 72 hours. Washing down saturated mountain slopes (included seasonal snow melt run off which by itself raises river levels significantly) the proverbial flood gates swung open inundating and devastating parts of our town particularly the Cougar Creek area, and in a downstream domino effect barraging many others communities including Calgary with this torrent of nature’s fury. I found myself numb after hours of helplessly watching news clips of this mind boggling destruction and forecasts of doom. When the sun came out for a brief period and I went outside for a short walk and felt a thawing effect on my frozen mind. Gazing at this blue sky (albeit temporary) released me from this death grip of darkness to reveal an inexplicable gratitude for my neighbours. In the days, week and months that followed emergency services kicked into high gear with heavy earth moving equipment to contain the destruction and effecting contingency plans for the many purged from their homes. The greater (and Great) community of Canmore wasted no time stepping up to the plate, opening doors and hearts, rolling up sleeves and getting in the trenches to do whatever needed doing. The parables for life and the world are not too distant. I marvel and beam with pride at this community that is my home and reminded that the resilience of our social fabric becomes most apparent during times of crisis when we need to rely on the strength of the pack.